We are a leading Manufacturer of aluminium zippers from Delhi, India. Our company is recognized for providing elite array of Aluminum Zippers to our clients. 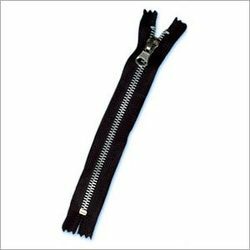 The complete assortment of zipper we provide is fabricated by employing premium-quality material obtained from specialized vendors of the industry. These zippers are obtainable in varied sizes, dimensions, patterns and colors that are extremely unique and eye-catching. We check each zipper on predefined norms of quality in order to offer defect-free range. Looking for Aluminium Zippers ?